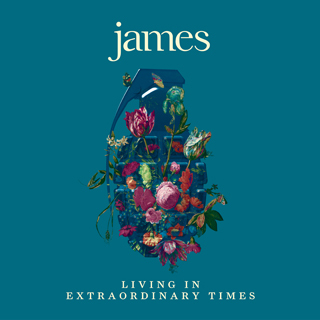 Living in Extraordinary Times by James – Album Review. 15th album reviewed. This is the 15th album from indie pioneers James – and what an album it is. After 35 years in the music industry, it’s remarkable that this record contains such varied content and experimental sounds. It’s an album that will seep into the very core of your soul, one way or another. I will be the first to admit that I was late to the whole James party. Back when the band started, I really didn’t see what all the initial hype was about. But as I grew older, with the band constantly around, I learned to appreciate them and, eventually, love them, away from all the daisies and hullabaloo that was the scene-centric music industry back then. This album is produced by the legendary Charlie Andrew (alt-j, Wolf Alice) and there is no stone left unturned when it comes to innovation, imagination and experimentation. 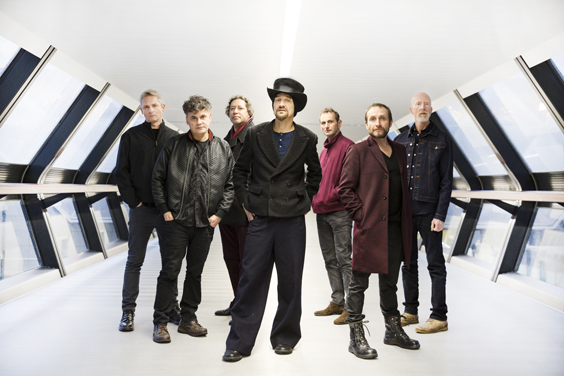 Lead singer Tim Booth, is just as outspoken as ever with his lyrical views, and it appears there are plenty of social issues that he takes a well-educated swipe at. ‘Hank’ is a prime example of this, where he tells listeners that “white fascists in the White House” are giving “NRA high fives”. The whole tone of the album is charged with like-minded observations. The effects in which he delivers the lines add even more fire to their belly, without ever becoming a rant. It will catch you with its rhythmical layering of drums, making you feel like you are going into battle. Indeed, it’s a much dancier affair, with the use of percussion throughout outstanding and evocative. ‘Coming Home (Pt 2)’ is clearly a follow up to classic ‘Come Home’, however they are musically worlds apart. The track shows a raw emotional side, clearly written by someone who is away from home and the things they love. It is filled with passion and almost like a diary entry in the way it is written. It’s emotional and endearing. One of the stand out tracks is ‘Leviathan’. With some remarkably hooky keyboard riffs lulling you into a false sense of security, before exploding into a cacophony of techno vibes, it will melt your mind in disbelief that it is James you are listening to. ‘Heads’ is another great tune and atmospherically gripping with its drum beat almost acting like a heart beats pulse throughout, before the bass line adds even more meat to the bones. It is as politically charged as most of the other tracks on here and reflective of the political disarray in the United States. There are times when the track seems to just run away with itself, which is no coincidence when you really listen to the lyrics; it feels like you have stepped into a living piece of art. There are on this album the usual anthemic contributions that have become James’s stock-in-trade. ‘Many Faces’, which I heard them play live earlier this year, with its Caribbean vibe will certainly ignite some movement into you. As candid as the album is, the evolution of Booth et al as been an interesting journey and it is refreshing to see a band who have been around this long able to adapt and change so easily. The title track ‘Extraordinary Times’ is infectious and a definite throwback musically to the shoegazery indie layers we are all used to from James. It contains some extra little titbits thrown in just to modernise the sound and to enhance the whole experience of the song, with some thrashing frantic fuzzed out guitar build ups before tearing everything down to nothing in an almost punk style. This whole album of 12 tracks, plus 3 bonus tunes will engulf you in musical genius; however the title track of their EP, Better Than That, is the most iconic tune on the album. It will be stuck in your head for weeks to come. James recently announced a joint UK tour with fellow British music heavyweights, The Charlatans in December of this year. It’s a gig definitely not to be missed.